children’s | I'm not stalking you. I have a book that I got as a child. It is called Stories of Fairies, Elves, and Little People by Francine L. Trevens. I think I got it for Christmas or Easter or something from the weird neighbors next door. I think they were religious people, so it is sort of a strange gift to give someone, but whatever. It isn’t a book anyone would have ever heard of. It looks like maybe it would was sold at the dime store. Maybe it came in one of those big pre-packed, impersonal Easter baskets from the grocery store, with coloring books and a plastic bunny bank. 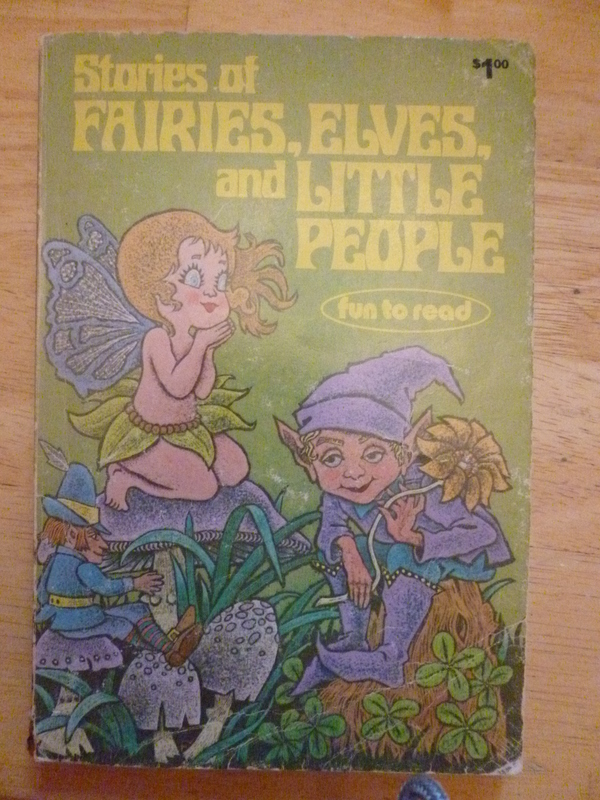 The book was made up of many short stories about fairies, sprites, goblins, and trolls. And to be honest, most of them are pretty horrible. Just not quality literature at all. Probably just written for the paycheck. But one story interested me. It was called Have You Ever Seen a Pink Leprechaun? The star of the story was a pink and purple pixie named Jennifer. (Dang, I could have sworn she was a fairy? Hence, the name of the post.) Oh-wow. Coincidence. That just so happens to be my name. As I got the book just as I was beginning to learn how to read, I of course went through and circled my name everywhere that I saw it in the story. The story is actually about a family of leprechauns who find a pink and purple baby on their front porch. She is not only a different species and color than the family raising her, she is also the only girl child. To make matters worse, they call her “Orphie” (short for Orphan). Her leprechaun “brothers” pick on her mercilessly. Then one day the fair comes to town. But it is not just any fair. It is a PINK & PURPLE fair! All the people there look just like Oprhie! 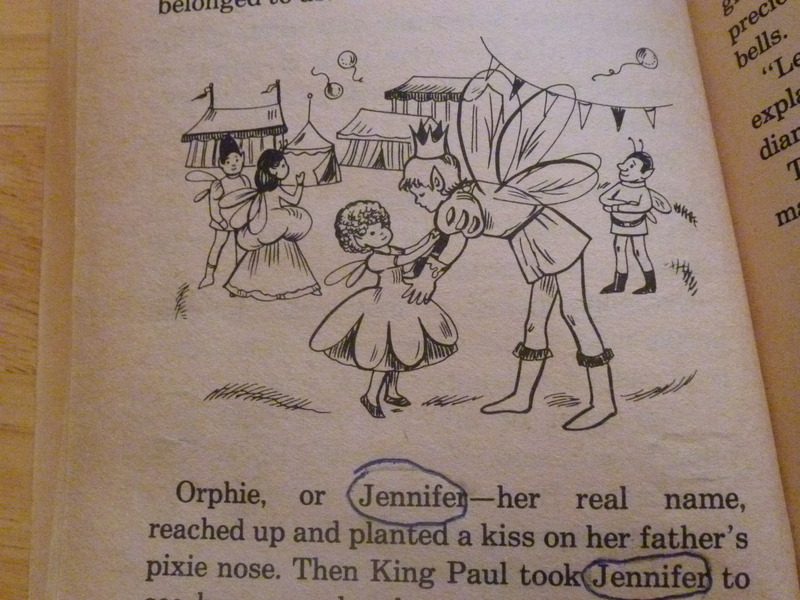 Jennifer and her father, the Pixie King, are reunited. Illustrated by Jesse Zerner. Being a kid whose father died before I was born, I thought this was a pretty cool concept. A father who loves his daughter so much that he never stops looking for her? That is powerful. AND they ride on a unicorn. But wait, it gets even better! Then the pixie father goes to pay off the leprechauns and to take Jennifer (Orphie’s real name) home. But then they fight over her. I had such a small family growing up you couldn’t have sneezed or they would have blown away. It seemed great to me that this pixie, with my name, decked out in awesome colors, should be loved by two families so much. Except that isn’t really what it is like in the book. In the book, each side just seems greedy and fights over her like property just because the other side wants her. In the end, Jennifer decides to go live with her dad, but plans to visit the leprechauns during the summer and on school vacations. It is like one big, colorful divorce. So, even now, sometimes I think of that story and Jennifer, the pink and purple fairy. (Hey, I have been thinking of it that way for like 30 years, I am not going to correct my brain now.) And if I mention it, people just look at me funny, because they have never heard of the story. But now you have. I hope you found that it enriched your life. Posted in Childhood Reminiscing, Entertainment Worship & Review and tagged and Little People, book, children's, Elves, Fairy, Francine L. Trevens, Have You Ever Seen a Pink Leprechaun, I. Waldman & Son, Inc., Jennifer, Jesse Zerner, literature, Moby Books, Pink, Pixie, Playmore, purple, Stories of Fairies, story. Bookmark the permalink. 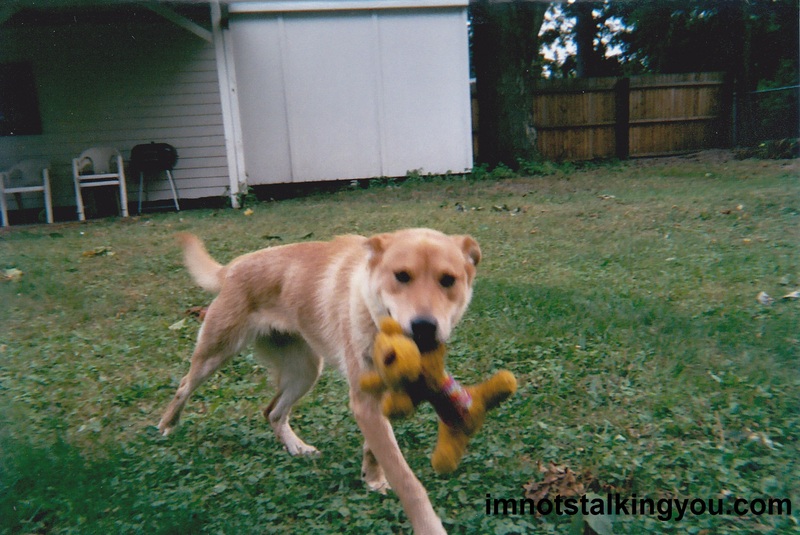 Dedicated to my favorite puppy, Dave D. Canine, who we brought home exactly 9 years ago today. Sitting in a cage at the shelter all alone. She wanted a forever home. Human food & fresh laundry. And people who loved her. I may just explode with happiness,” Dave thought. Then a man & woman came by. The woman was very interested in Dave. But she wanted to look out the window too. The man & woman came back. And they loaded Dave into their car! Dave loved to ride in cars. “But where are we going?” Dave wondered. And her orange head to the ground. Then they led her into a building. Smelling of ammonia & bleach. But this place smelled. . .homey. It didn’t seem like any other dogs were here. And climbed up, without any fear. How to get down the stairs. She stood there pondering for several long minutes. Putting one paw in front of the other. . .
Dave learned that she loved the stairs! And race back down again. And the woman was called Jennifer. They would brush Dave & take her for walks. on the thick carpet floor together to nap. Since she had been in her puppy pack. She could be a part of. Dave was so happy, she couldn’t contain it. She felt all her love & all her happiness building inside. It rose from her tummy & went to her head. And “HOOOOOOOOWWWWWWWWWWWWLLLLLL” is just what came out. Or a howl of happiness?” they asked each other. When Dave smiled & howled again. And her forever home too. 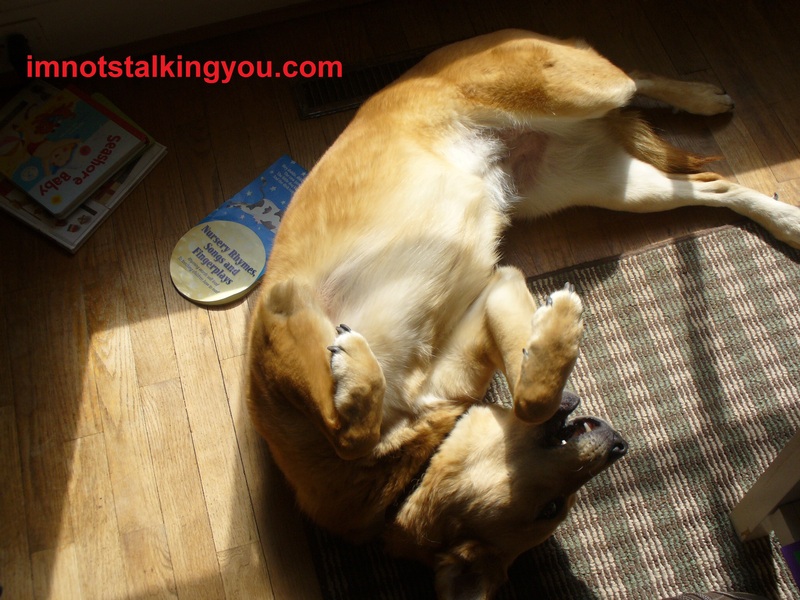 Posted in Unusual Poetry & Writing and tagged a dog named Dave, adopt, children's, Dave, dog, howl, Lenawee Humane Society, literature, mutt, shelter, story, writing. Bookmark the permalink. 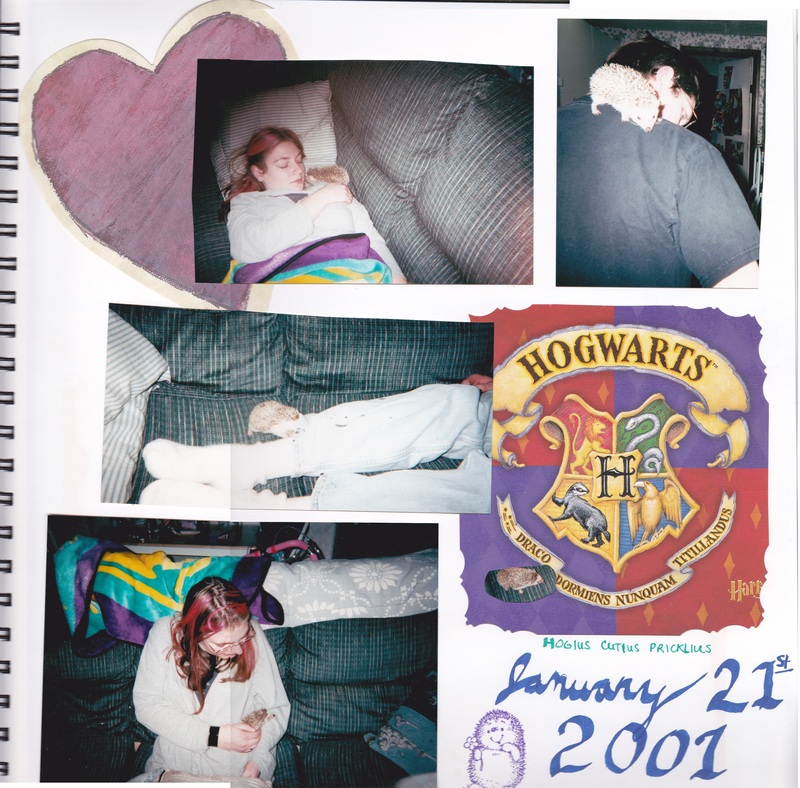 Page from my scrapbook featuring Hogwart the hedgehog. Hogwart the hedgehog sniffed the air. And let out a big yawn. She opened her eyes and looked around. It was just after supper time. The smell of turkey & mashed potatoes was in the air. Yummm. She licked her lips. “There you are, Hogwart,” Jason said. What is Christmas, Hogwart wondered. Jason reached into Hogwart’s cage and picked her up. Hogwart didn’t like being picked up. She did like Jason. He always gave her treats and played with her. Jason put Hogwart on the floor. appeared in the house a week ago. It smelled nice, and it glowed. “Hogwart, be careful of the Christmas tree. More of this Christmas stuff. What could it be? Hogwart climbed into a box that held a warm sweater. She tried to nestle into it, but Jennifer picked her up. I don’t care, I just want to sleep on it, Hogwart thought. Then Hogwart started to run through the wrapping paper and bows. This is fun, she though, and so pretty. She found a candy cane, all wrapped up, and tried to figure out how to open it. I just wanted to taste it, Hogwart thought. Then Hogwart smelled something especially yummy. She ran over to a pretty package. She couldn’t see in it. It wasn’t opened like all the others. Hogwart looked at Jason & Jennifer and they were smiling at her. Hogwart sniffed it and licked it and then she bit at the paper. When it came off, Hogwart had a box of crickets! Yummy! Yummy! Yummy! Hogwart liked them better than ice cream. “Merry Christmas Hogwart!” Jason and Jennifer said. Oh, this is Christmas, Hogwart thought. And trees come indoors to keep away from the cold. Christmas is making everything pretty. Christmas is happiness and love. * The use of the name Hogwart in no way indicates a connection to J.K. Rowling or her works. Posted in Unusual Poetry & Writing and tagged African Pygmy, book, children's, Christmas, crickets, hedgehog, Hogwart, Hogwart Discovers Christmas, pet, story. Bookmark the permalink. 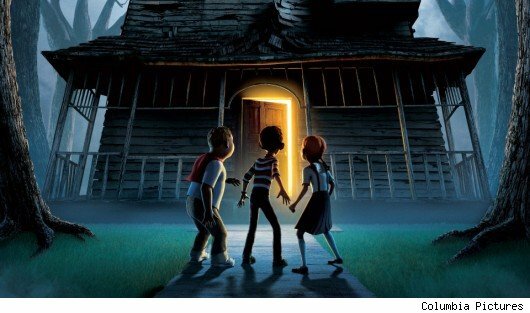 The moral of the kids movie “Monster House”? Never rescue a circus freak & bring them home. Posted in What I Learned This Week and tagged children's, circus, entertainment, freak, Monster House, movie, rescue. Bookmark the permalink.